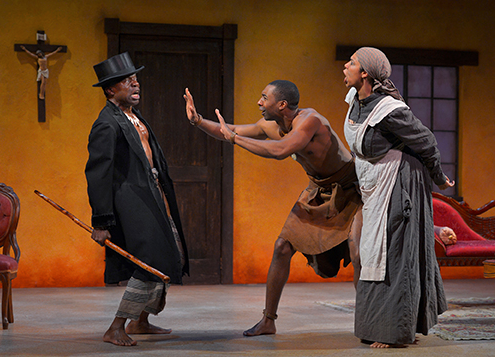 (from l to r) L. Peter Callender as Uncle, JaBen Early as Tamba, and Elizabeth Carter as Mai Tamba in Danai Gurira’s “The Convert”. Photo Credit: Kevin Berne. The opening sequence, performed mostly in the Shona language, of Danai Gurira’s “The Convert” throws us rapidly and delightfully into the complex story to follow. A native woman, dressed in Western garb, is cleaning what is clearly the home of a Catholic missionary. Her ambivalence about the crucifix and the statue of the Virgin Mary are clear, as she apparently attempts to exorcise them. A somewhat confused young woman enters with a young man, both in native garb, everybody quite excited. When the missionary (also an Africa native) enters, the housekeeper pleads with him to take on the young woman as a servant to save her from a forced marriage to an old man. Moments later, the old Uncle himself arrives, laying claim to the girl. After some discussion, the missionary agrees to take on the young woman and educate her as a Catholic. Learning that she is to go to school, the girl is beside herself with joy. This girl, Jekesai, re-christened as Ester, is “The Convert”. Her story will provide the pretext for the playwright to brilliantly tell of the colonization of what is now Zimbabwe, and the subequent rebellions which began in 1897, and continued until independence was achieved in the 1960s. 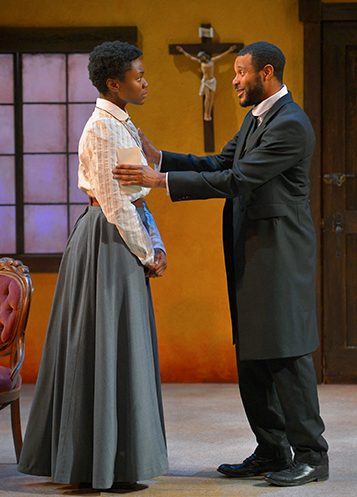 Katherine Renee Turner as Esther, the convert, and Jabari Brisport as Chilford, the missionary. Photo Credit: Kevin Berne. Playwright Danai Gurira (who is also a distinguished actress) has stated that she is inspired by a desire to write the stories of Afircan women that are rarely depicted onstage. With “The Convert” she succeeds extraordinary well. The women of this play — the convert Ester, the servant Mai Tamba (whose son is drawn into the rebellion) and the Western educated intellectual Prudence — are remarkable, moving, and memorable creations. The male characters are not short changed, however. The true believer Chilford, westernized and dreaming of becoming a Jesuit priest and his best friend Chancellor, who takes advantage of opportunities but harbors no illusions about the colonists, are complex and engaging. Ester’s Uncle is both clownish and dignified as a proud native man trying to assert his rights and the rebellious but likable Tamba is a fully rounded character, complex and conflicted. These people are richly detailed and multi-faceted, all of them revealing behaviors both cruel and wonderful. This playwright displays a depth of empathy which is only seen in truly exceptional artists. Clearly, Gurira is a major playwright whose career bears watching and whose impact on American theatre is destined to be enormous. The intellectual Prudence (Omoze Idehenre) challenges Ester (Katherine Renee Turner) to think for herself. This remarkable work has been carefully and expertly directed by Jasson Minadakis and the cast is so fantastic that it is difficult to think of superlatives worthy of these performances. Each cast member can justifiably be called “brilliant”. Shining particularly bright are L. Peter Callender as Uncle, demonstrating yet again his remarkable range and skill, and Omoze Idehenre as Prudence. Ms. Idehenre gives a great performance of a great character. “The Convert” offers tragedy, comedy, history and character at a level of excellence rarely encountered. The set, costumes and other technical support are equal to the play and the performances. If there is anything that is a “must see” this season in the Bay area, “The Convert” surely qualifies. 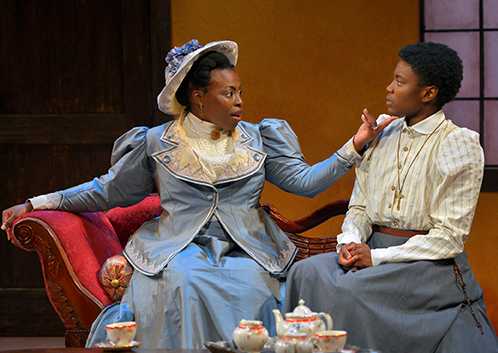 “The Convert” by Danai Gurira, presented by Marin Theatre Company. Director: Jasson Minadakis. Scenic Designer: Nina Ball. Lighting Designer: Gabe Maxson. Costume Designer: Fumiko Bielefeldt. Composer & Sound Designer: Chris Houston. Dialect Coach: Lynne Soffer. Fight Director: Dave Maier. Cultural Consultant and Guest Vocal Artist: Julia Chigamba. Properties Artisan: Kirsten Royston. Jekesai/Ester: Katherine Renee Turner. Tamba: JaBen Early. Mai Tamba: Elizabeth Carter. Chilford: Jabari Brisport. Uncle: L. Peter Callender. Chancellor: Jefferson A. Russell. Prudence: Omoze Idehenre. Please like us on Facebook and subscribe by clicking as indicated on the upper right corner of this page. Thank you! Posted in Reviews.Tagged Charles Kruger, Chris Houston, Danai Gurira, Dave Maier, Elizabeth Carter, Fumiko Bielefeldt, Gabe Maxson, Jabari Brisport, JaBen Early, Jasson Minadakis, Jefferson A. Russell, Julia Chigamba, Katherine Renee Turner, kirsten royston, L. Peter Callender, Lynne Soffer, Marin Theatre Company, Nina Ball, Omoze Idehenre, Rhodesia, San Francisco Theatre Reviews, The Convert, theatrestorm, Zimbabwe.